Naomi Sato demonstrates the Japanese shō for composers; recorded in 2009 at the Atlas Academy, Amsterdam. 38-year-old Japanese instrumentalist Naomi Sato, born in Tokyo, living in Amsterdam, has two musical friends in her living room to turn to when things in life don't take the right course. Or to create sunshine inside, when it is raining outside: the saxophone and the shō. Naomi plays them both, passionately. How rich can life be, when music enlivens your environment, your soul. Music with a satiny gloss comes out of Naomi Sato when you step aside and let her caress the saxophone or blow the shō. Naomi just loves her music. Mastering the saxophone is already a gift, but to also excel in shō-playing, is out of the ordinary. Of all the heavenly musical instruments on this planet, the shō might well be the rarest one. 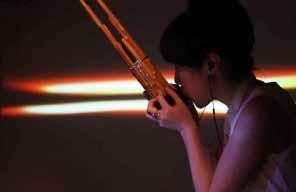 The shō is a traditional Japanese free reed instrument, which first was introduced in China. It stems from the Tang Dynasty in China, which lasted from 618 until 908. The instrument came to Japan during the Japanese Nara period (AD 710 to 794). The shō is modeled on the Chinese sheng, although it is smaller in size. The instrument does not exist anymore in China. The Japanese kept the original styl e of the shō for more than 1000 years, while China developed the instrument in 1000 years. 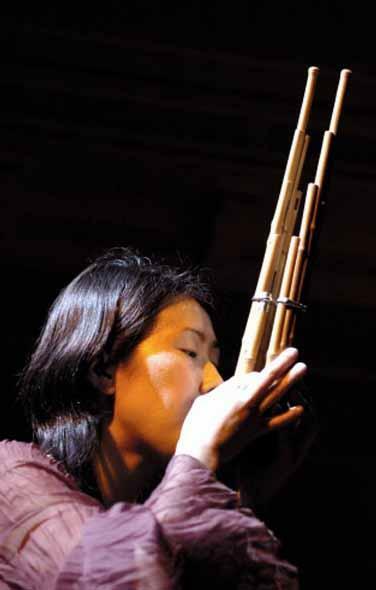 The shō is a kind of mouth organ, consisting of 17 slender bamboo pipes, each of which is fitted with a metal free reed. It has a base with a mouthpiece, and the player has to blow into that, and by inhaling and exhaling, and closing the finger holes at the bottom of the bamboo pipes, he produces sounds. The shō can produce chords as well as single notes. Two of the pipes are silent, although there are also musicians who play on a shō with 17 pipes that can all produce sounds. The shō looks like a phoenix, the two pipes being an aesthetic element - forming two symmetrical wings. The shō can produce its sound 'forever, which is why it looks at lot like the call of a phoenix. Like the Chinese sheng, the pipes are tuned carefully with a drop of wax and the instrument, especially the base, has to be heated up as a preparation before playing, in order to avoid condensation, because the reeds in all the 15 of 17 pipes must remain dry to produce pure tonalities. The heating up of the base is a kind of ritual. Several contemporary composers have written music for the shō, such as Toru Takemitsu and Toshio Hosokawa. But also western composers were inspired by the shō, like John Cage, who composed for Mayumi Miyata, one of the most famous sho players in contemporary music. Naomi Sato intertwined with Laura Carmichael in an acrobatic duet of Duo X.
Naomi Sato has been lving in Amsterdam for the past 16 years. She performs both as a soloist and in various chamber music ensembles. She and Laura Carmichael form Duo X (see photo on the right and the video below), where Naomi plays the saxophone, and Laura the clarinet. Naomi is moreover part of the Atlas Ensemble, which has made a name for itself throlugh the use of traditional non-Western musical instruments alongside modern Western instruments. Naomi plays the shō here. "I have been with Atlas for 10 years now," she says, "and I have learnt a lot through playing with so many traditional masters of music from all over the world. I feel as if I form a bridge between Western and Oriental cultures, and between traditional and contemporary music." Naomi has also recently produced a brand new CD entitled Pochan (www.pochan.nl) together with percussioniast Christiaan Saris. "Music was so natural for me; it has always been with me, since I was a child." In Tokyo Naomi studied the saxophone for 4 years (1994-1998) and got her Master's Degree, although she had been playing the piano for almost 20 years and even the harmonium as a young girl. Naomi Sato was a musical prodigy. Naomi: "I discovered my musicality when I was very little, about 2 or 3 years old. I had a very good hearing. At the house of my grandparents there was an old harmonium and at 3 or 4 years I started to play on this instrument, copying all the songs I had heard on television. I immediately knew how to play the organ. It was my aunt who played the harmonium, as a hobby. It appeared that I picked up the sounds already at the age of 3 and I also played on my cousin's piano. I started to play classical music on the piano at 4. Music was so natural for me, it has been with me, since I was a child. It is always with me. I was also dancing a lot as a little child. I guess I was just playing music with my body. Sometimes however I prefer to hear no music, I want silence around me." "I didn't choose the saxophone; the saxophone chose me." Despite her intensive, long years of piano study, Naomi Sato chose to study the saxophone at the age of 15. That was the moment she decided to become a professional musician. She coincidentally 'came across' the saxophone at junior highschool in Japan when she was 12. Naomi: "I played the saxophone, just by coincidence, at junior high school. That school had a very good band, so while I kept on following my private piano lessons, I gradually played more on the saxophone. It was very hard though, playing and studying the saxophone, because with our band we participated in tough competitions so we had to rehearse a lot. In Japan they have very big competitions for schoolbands. However, I think I didn't chose the saxophone; the saxophone chose me. It was the size of my hand that decided for me to be a saxophonist. Because my fingers were long enough to play the tenor saxophone. Often the hands of little children are too small to play the saxophone, so instead they are recommended to play other small instruments, like the flute or the clarinet. There are so many side keys, and if your finger is not long enough you can easily touch the side keys, without wanting to and then you get false notes. My hands were big enough to play the tenor saxophone, so that was my first saxophone. Later I started to play the alto saxophone, which is usually the saxophone you start with. Of course as a classical saxophonist I play all kind of saxophones now. I play everything, also free improvisations, however not standard jazz music. I loved piano to play the piano even after I started to play the saxophone, but I didn't think to become a professional as a piano player. Although my parents tried to prevent me from becoming a professional musician, when I started to take piano lessons, in the end they gave up when I was 15 and felt that music is my life." After four years of hard working at the Tokyo National University of Fine Arts and Music Naomi graduated a got her Bachelor's Degree in saxophone. Then she went to Holland and continued to study the saxophone for four years until 2002 and got her Master's Degree at the Conservatory of Amsterdam. 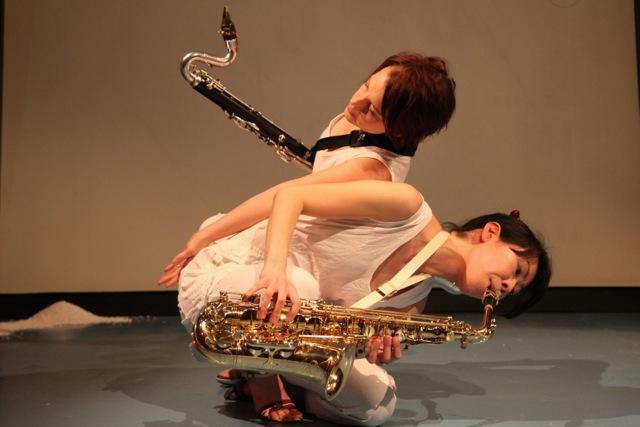 Already during her studies in Amsterdam, Naomi started performing professionally with the saxophone Duo sato/sliepen and Amstel Saxophone Quartet. With them Naomi performed in De IJsbreker in Amsterdam, Vredenburg in Utrecht and the Chamber Music Festival Almere. She also played with them at the opening of an exhibition wing of Van Gogh Museum, in the Contemporary Art Forum in Luxemburg, in the Tokyo Opera City, the Tokyo Sougakoudo Hall and other places. Unfortunately Naomi stopped playing with the quartet around 2003, when she started with Duo X and the Atlas Ensemble. With both she played many different kinds of contemporary music and she did an improvised music project. 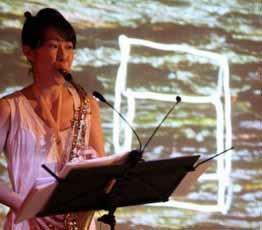 Naomi studied saxophone with Nobuya Sugawa (Tokyo), Arno Bornkamp (Amsterdam) and Claude Delangle (Paris). She has played with the Philharmonic Orchestra of Tokyo National University of Fine Arts and Music, l'Orchestre de l'Académie européenne de musique with Pierre Boulez (Aix-en-Provence, France), Ensemble Lucilin (Luxembourg), the Ives Ensemble (Zaandam, the Netherlands) and the Residentie Orkest (The Hague, the Netherlands). "When I saw the shō, I immediately thought: this is my instrument." Naomi Sato playing the shō surrounded by a beautiful landscape. Music and nature become one. In her last year at the University of Tokyo however something peculiar happened. It was 1997 and Naomi wanted to follow classes in traditional Japanese music (Gagaku, typical music which was played for the imperial court). Naomi: "At that time I had to play a lot of contemporary music on the saxophone, I studied classical music from the baroque period to contemporary classical music. However that did not feel natural to me. Because it had so many strange sounds on the saxophone. Then I thought: the Japanse traditional music also has very strange sounds, so if I start studying traditional Japanese music, which is strange enough for me although Japanese music belongs to my cultural roots, I might understand the western contemporary music better. Many western composers are also much influenced by eastern traditional music. So I decided to go to the Japanese music class. There I discovered the shō. Actually it was not my first plan to study the shō, because I wanted to play an instrument closer to the saxophone. I could also have chosen the koto, a sitar, or the bewa, a lute. But when I saw my teacher playing the shō, I just couldn't get away from it. I immediately thought: this is my instrument." "The music is so pure: it vibrates with my soul." Naomi: "I fell in love with the shō and it was love at first sight. The sound is so pure and delightful, because of its spiritual characted. It vibrates with my soul. In Gagaku music the shō has the role of an 'air voice between heaven and earth'. 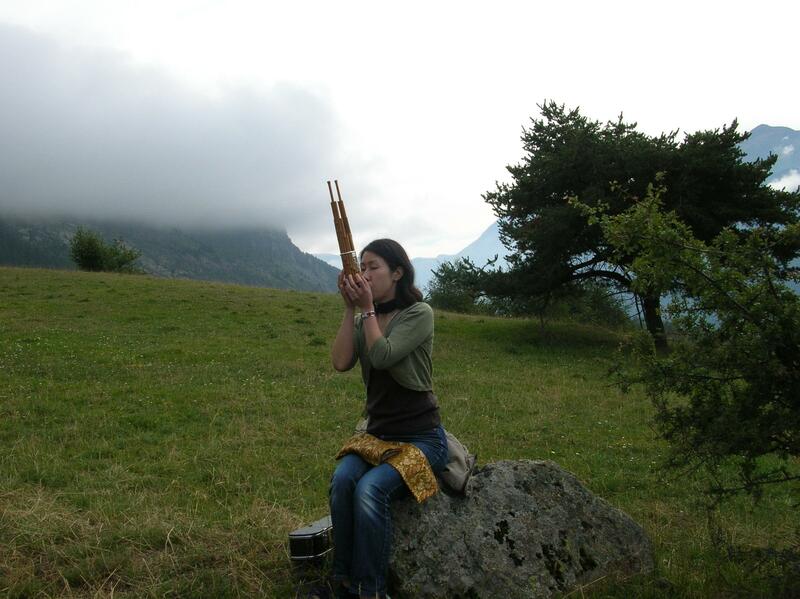 This spiritual meaning of the instrument strongly appeals to me now, thanks to participating in the Atlas Ensemble. I studied the shō one year in Tokyo, where I had a fantastic shō professor, Ko Ishikawa." He has been a professor at the Tokyo University in shō for some years, but now he stopped teaching and performs as a professional shō player, both as a soloist and as a member of the Gagaku ensemble Reigakusha. His performances of both traditional and new music for shō have been highly praised in Japan, Europe and the USA. "When I was in Holland, studying the saxophone, I went back to Japan, every half year to take shō lessons with Ishikawa. Because in Holland there are no possibilities to study the shō. But since I had a click with the instrument, I didn't need so much lessons anymore. The instrument and me: we are automatically one. Of course I needed to study Gagaku music and its history. But Ishikawa was a great teacher and very inspiring. Actually I learned a lot from him with regard to mentality. I learned how to best play the shō. The Gagaku tradition requires you to be still while playing the music. Then you can be a part of the right atmosphere. The technique you have to develop by yourself, but he taught me many other things. Like the fact that Gagaku music is spiritual. It stems both from Buddhism and Shintoism. I did more research on the Shintoism side, because both Gagaku music and Shintoism are deeply related with eastern natural philosophy. So all the tonalities have a relationship with a natural philosophy. Gagaku music is related with the four seasons, the four directions (north, west, south, east) and with colours and parts of the bodies. I play both traditional and contemporary music on the shō. When playing contemporary music, you can be physically more expressive in your attitude, but when you play traditional music, you have to remain as quiet as possibile. That is very important with this instrument and the Gagaku tradition, it is out of respect for the spirit and the tradition of the instrument and the Gagaku tradition. 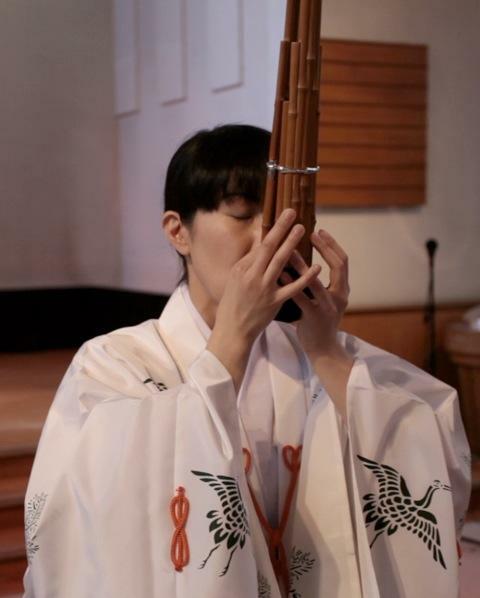 When I play the shō, I feel as if my life is dedicated to the instrument, because I have to play and breathe in two directions: inhaling and exhaling."